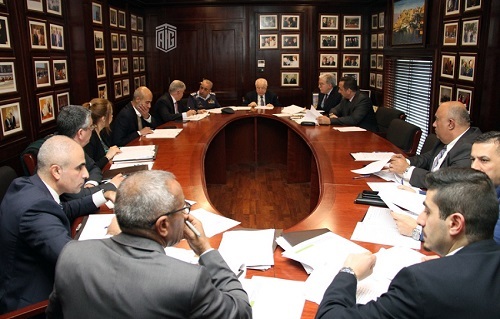 AMMAN - The Joint Board for Military Development and Innovation held its 7th meeting at Talal Abu-Ghazaleh Global (TAG.Global)/ General Administration Building in the presence of members of the Board of Directors. The attendees were briefed on its achievements, and the Board continued its establishment of the Executive Committees including ‘Creativity’, ‘Methodology’, ‘Solutions’ and ‘Turning Inventions into Products’ committees to work in parallel to collectively achieve the objectives and create a suitable environment for creativity in different fields. During the meeting, the Board stressed the importance of exploring all potentials in the field of ICT-based military creativity, development and innovation. Furthermore, the Board endorsed the initial outlines for a conference to be held on the “Role of Information Technology in Supporting Military Industries and Strengthening Partnership between Private Sector and Military Institutions”. The participants also discussed the Board’s Incubator Project which will be established at Talal Abu-Ghazaleh University College for Innovation (TAGUCI) in collaboration between TAG.Global, Zain Jordan and King Abdullah II Design and Development Bureau (KADDB), noting that work priorities and needs of the Armed Forces in this field have been identified, in addition to the activities which the Incubator will focus on. Additionally, the Board members discussed the means for enhancing cooperation in training programs and capacity building through specialized training in e-archiving, systems development, patent drafting and holding workshops for concerned stakeholders, communication engineers and information technology experts. They also tackled other issues regarding the finalization of linking the Armed Forces, KADDB, and the General Directorate of Civil Defense to the Arab States Research and Education Network (ASREN), as well as, the activation of TAG.Global’s knowledge stations which were established at the Armed Forces and security apparatus' units, and the establishment of a new knowledge station at the Royal Medical Services - Princess Aisha Bint Al Hussein College for Nursing and Health Sciences in Marka. 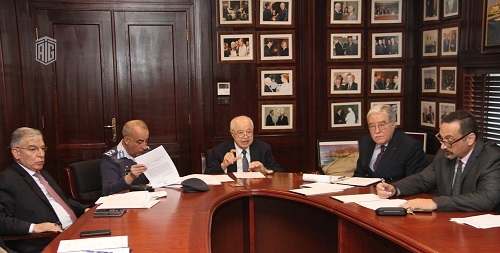 At the end of the meeting, Dr. Abu-Ghazaleh expressed his pride and appreciation to the Armed Forces-Arab Army and all security apparatus, underlining the significant role exerted by these institutions in protecting and providing the required environment for people’s life, work and stability affirming that they are equal to their global counterparts in terms of efficiency, capacities and knowledge. He also expressed hope that more progress will be achieved under the leadership of His Majesty King Abdullah II bin Al Hussein. It’s worth mentioning that the Joint Board for Military Development and Innovation is the outcome of the cooperation agreement signed between the Jordanian Armed Forces - the Arab Army and Talal Abu-Ghazaleh Global in 2017 which resulted in the establishment of a number of knowledge stations that constitute the main driver for creativity and excellence through specialized training for the support of smart transformation projects and creation of the necessary infrastructure for creativity.